Quantitative analysis of acoustic signals emitted during fracture processes within a body under load can be used to obtain valuable information about these processes. In addition to an accurate localization of the fracture, an inversion of the moment tensor can be performed under certain assumptions, which yields information about the fracture mode, the total energy released and the orientation of the rupture plane. For a numerical simulation of failure processes finite element methods are convenient. A combination of an Adaptive Fixed Crack Model and an Embedded Crack Model is applied to model progressive damage in steel reinforced concrete. Within the scope of the collaborative research centre SFB381, a pull-out test was performed in combination with quantitative acoustic emission analysis. Additionally this experiment was modelled by a finite element method. The integrated interpretation of the results and a combined visualization gives a good understanding of the failure mechanism of the bond between the steel bar and the concrete matrix. An integrated interpretation using both, quantitative acoustic emission analysis from experimental data and the results of a simulation by a finite element method gives a good understanding about the failure processes in a member. This process is enhanced by a special visualization program. While being useful for validation and calibration of new material models, comparison of damage data gained from numerical simulation and experimental results can also enhance the understanding of active damage mechanisms. Furthermore, preliminary simulation of tests to be carried out can contribute useful information about zones of high damage activity. Sensor placement in consideration of information gained through simulation can lead to better testing results. The detection and localization of cracks and the determination of mechanical parameters of failure in steel and steel-fibre reinforced concrete are major topics of the Non-destructive Testing group at the Institute of Construction Materials (IWB). Quantitative acoustic emission analysis is a very suitable method for these applications. Numerical simulation of material behaviour is one focus of the Institute of Statics and Dynamics of Aerospace Structures (ISD). Several research projects specialize in development of new material models suitable for simulation of brittle compound materials like C/C-SiC ceramics or concrete. To study the bond behavior of steel reinforcement in a concrete matrix, a pull-out test of a steel bar (Ř 15.6mm) with five ribs (see figure 1, left) out of a 20cm concrete cube was performed. The setup of the experiment (dimensions of the cube and rib number and geometry) was chosen to perform the test in an area of transit between pure pullout and cube splitting. Preliminary simulation showed that cube splitting was likely to occur at bars with 5 to 7 ribs at the chosen geometry. The goal was to maximize the activated damage mechanisms. Movie 1 shows the simulated damage propagation in one variant of the test body during the early stages of the pullout. The pull-out was controlled by a displacement rate of 0.012mm/s of the hydraulic piston (figure 2, bottom). There was some elastic deformation within the upper crosshead of the machine, therefore the relative displacement of the steel bar to the concrete cube is plotted versus load in the upper graph of figure 2. Fig 1: Left: Photograph of the ribbed steel bar (diameter 15.6 mm). Right: Sketch of the concrete cube (edges 20 cm) with pull-out of the bar. To obtain information from the internal processes, acoustic emissions were recorded by an 8-channel transient recorder with a sample rate of 1MHz and an amplitude resolution of 12bits per channel. The eight piezo-electric accelerometers were evenly distributed on all surfaces of the cube. In total some 230 acoustic emissions were recorded. The total number of events was much higher, but due to the delay of the recorder during the readout of every single event on the hard drive, only a small number of them could be stored. Fig 2: Mechanical data of the pull-out test. Top: Load-displacement showing the stepwise loss of bond and the beginning pull-out in the final stage. Middle: Load-time. Bottom: Displacement of the piston over time, representing the pull-out velocity. The onsets of the signals were picked using the WinPeckeră software [Grosse 2000] and localized by the implemented HYPO-AEă routine [Oncescu & Grosse 1996]. For about 210 events the position could be calculated with a mean error of approximately 5millimeters. A minimization of the error is performed by using eight sensors instead of four, which are necessary to evaluate the three spatial coordinates and the time. To visualize the chronological occurrence of events, these are plotted in colored markers (figure 3). The total time of the test is divided into six intervals, represented by one color each, as shown in the color bar. Red events in the beginning of the test, followed by orange, yellow, green, blue and violet for the final stage. Fig 3: 3D-Plot of the located acoustic emissions. The colors represent the relative time of their occurrence as given in the color bar. Acoustic emissions located in the lower right of figure 3 occur in the beginning of the test, probably due to stress between the non-planar surface of the specimen and the support. The majority of acoustic emissions in the middle and final stage of the test are located as expected in the vicinity of the bonding zone, some early events lie along the stress-trajectories. A zoomed projection of the acoustic emissions in the central area on the x/y-plane is given in figure 4. Additionally, for all events the error bars are plotted. This shows the arrangement of events in a ring around the ribs of the steel bar. Inside the steel bar there are no acoustic emissions, as expected. Fig 4: A projection of acoustic emissions in the central area of bond into the x/y-plane (with error bars added) shows the arrangement of events in a ring around the ribs of the steel bar (dotted circle). No events should originate from inside the bar. The events in the black circle are investigated for their rupture mechanisms by a relative moment tensor inversion. For several events the given focal solution represents the downwards slip of the bar. The moment tensor contains all seismic moments and forces of a source of a rupture. With a suitable decomposition of this tensor even complex rupture mechanisms can be analysed. By this means the isotropic component (explosive or implosive volume change) and the double couple component (shear failure) of a fracture can be extracted for example. The released elastic energy of an event is given as seismic moment and by analyzing the orientation of the nodal planes, even rupture planes can be identified (Jost & Hermann 1989, Aki & Richards 1980). The inversion of moment tensors has been used in the field of seismology for several years. Some seismological surveys publish moment tensors for recent earthquakes with short delay (e.g. http://www.seismology.harvard.edu/projects/CMT/ for global earthquakes or http://www.ingv.it/seismoglo/RCMT/ for earthquakes in the European-Mediterranean region). The application of moment tensor inversion methods on small scale problems like the investigation of failure of construction materials is subject of various workgroups (Ohtsu et.al. 1991, Grosse 1996, Ohtsu et. al. 1998, Köppel & Vogel 2000, Finck 2001, Grosse et.al. 2002). A very promising method of a relative moment tensor inversion was suggested by Dahm . Dahms method is used for the example shown in this paper. For all these methods several assumptions, such as the model of a point source and sensor, the neglection of near-field terms and more are necessary. The calibration of the sensors seems to be valuable to obtain stable solutions, but a standardized method is not yet obtainable. Because of their localization, a cluster of 14events in the central area of the specimen was investigated in more detail (see circle in figure 4). With the method of a relative moment tensor inversion rupture mechanisms of these selected events were calculated. Amplitudes of the first half waves of the longitudinal waves were picked from the raw data for input. The geometry of the test suggests cracks with a major shear component due to debonding and a slip of the bar with vertical rupture planes, more or less concentric around the axis of the steel bar. Additionally, a collapse of pores, as well as an opening of cracks, is expected. Solutions of the moment tensor inversion for the selected events are illustrated in figure 5. In addition to the radiation patterns of seismic energy, results of the decompositions of the tensors are shown. These yield the relative seismic moment Mr as a measure for the energy with error and the percentile distributions of isotropic (ISO) and double-couple (DC) source mechanisms (Jost & Herrmann 1989). For the latter, the solutions of the inversion are given in front of the brackets. In the brackets are the solutions of a boot-strap analysis [e.g.Efron & Tibshirani 1986] with errors. The plots of the radiation patterns are an advanced depiction of the focal solutions (also called "beachballs"), known from seismologic and tectonic publications (Fowler 1990). In addition to the polarities of the incident particle motion, the amplitude is also displayed in a special spherical projection. Red stands for a positive motion, outwards from the point source (explosive), blue for a negative one (implosive). Due to the composition of the moment tensors containing an isotropic (pure explosive or implosive) portion and a double couple component the complex geometrical distribution of seismic waves with regard to a mixed mode rupture is visible, normally in a view from above. Fig 5: Illustrated is the distribution of the focal amplitudes of the events. Mr is the relative seismic moment or the intensity of the emission. As an example of the majority for the investigated events the estimated rupture plane is indicated by a black line for event 105. The majority of the events show similar rupture mechanisms. A negative isotropic component of circa 20 to 30% and a high double couple component of over 70% are observed in most cases. The orientation of the nodal planes suggest a fracture plane more or less vertical with a direction indicated by the black line in figure 5 for event 105. The polarities of the radiation of seismic energy also correlate with the expected mechanism. The blue color on the left corresponds well with the steel bar, which is pulled downwards, yielding negative onsets in the view from above (see also figure 4). According to the errors of the inversion these results promise a good qualitative evaluation of the rupture mechanics. Events 157 and 163 have a double couple mechanism with a very small positive isotropic component. The nodal planes are radial to the bar. The finite element code used for numerical damage simulation is a custom tailored software system developed at the ISD and several other institutes during the 1990s. As this software package is entirely written in C and the source code is completely available, it is easy to implement even complex material models. The material model developed for concrete simulation is an adaptive fixed crack model (AFCM). Cracking is represented by degradation of material strength in different planes of degradation (POD) (Fig.6). Those PODs can become activated and deactivated during the propagation of damage. The inelastic process of cracking is modeled completely in those PODs. Each of these planes of degradation has a dedicated set of state variables. Fig 6: AFCM: POD and stress vectors. Those state variables describe a limiting area or curve (for 2d-simulation) for each POD. By geometric transformation of this limiting area or curve it is possible to derive a failure envelope for cracking (Fig.7). The term "Adaptive Fixed Crack" in the appellation of this material model refers to how the orientation of the PODs is handled. PODs are established according to requirements (adaptive). The creation of those planes can be caused by mode I (tension), mode II (shear) or mixed mode cracking. During the further development of the cracking process, the orientation of once created PODs remains fixed. Fig 7: Crack initiation criterion. Like with the classical fixed crack model, this behavior relies on the assumption of a real crack that  after being initiated  keeps its orientation as a topological attribute in a determined location [Weihe 1995, Ohmenhäuser 2000]. This AFC-Model is suitable for simulation of cracking of solid concrete and  together with a special class of interface elements  for examination of damage mechanisms active in the bond between concrete and reinforcement. As available finite element post processing systems do not offer possibilities for combined visualization of simulation and experimental data, there was the need to develop a custom software system that could offer those features. 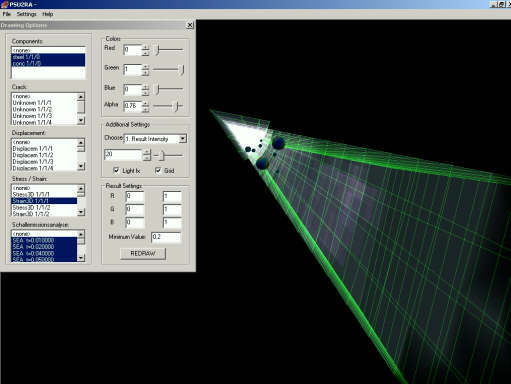 Fig 8: Visualization software for combined evaluation of simulated damage and acoustic emission testing results. Fig 9: Active damage mechanisms during pullout (simulation), visualization of simulation results together with experimental localization data (green dots) in the bonding zone (lower right). Result of these development efforts was a full featured (stress, strain, displacement and damage evaluation) finite element simulation post processing software for 2D and 3D simulation data, that additionally allows importing acoustic emission testing data (localization and RMI-data) and combined evaluation of simulation and testing results (Fig. 8 and 9) [Motz 2002]. Common post processor systems do not offer transparent visualization models. Results from the inside of the body are only visible by making cross sections or cutting parts out of the finite element model. The newly created visualization system allows the semitransparent display of models and results. Therefore it is possible to gain an immediate overview of all important damage processes inside the simulated and/or tested body. As shown in Fig. 9, simulation data matches well with testing results. Most localization data was acquired in the area of the bonding zone. Furthermore, simulation revealed that there must be extensive additional damage (pullout cone). Explanation for the very low number of events in other areas of the test body, was, that the used transient recorder operating in a triggered recording mode, was not able to register all events. The storage of entire signal waveforms recorded by several sensors causes the recording system to shut down the detection of new events for a short period (delay or dead time). Therefore, a considerable amount of events particularly in areas with lower activity gets lost. For the pull-out test of a ribbed steel bar out of a concrete cube, the quantitative analysis of acoustic emissions yields information about the spatial and temporal distribution of damage. The inversion of moment tensors of events in the zone of bond between the steel reinforcement and the concrete matrix gives reasonable results. The pull-out is visible in the radiation patterns by a vertical dip slip parallel to the boundary of the two materials, as expected. A very good correlation of the damages localized by the acoustic emission technique exists with the simulation of the pull-out test by finite-elements. Due to the combined evaluation of both  simulation and experimental  results, it is possible to get more detailed and precise information than could be drawn from each method alone. The disadvantages given by the two-dimensional illustration of the inversion results are evident for the case of engineering members. With the three-dimensional imaging tool, the results of acoustic emission measurements and the simulation are combined. By looking into the member from different views and perspectives even complex failure mechanisms are understandable and can be analyzed. These investigations are part of our work in the collaborative research centre SFB381 at the University of Stuttgart, which is financially supported by the Deutsche Forschungsgemeinschaft (DFG). We gratefully acknowledge this support. The radiation patterns (Fig. 5) are imaged by a generator kindly provided by Lindsay Linzer, Rock Engineering Dept, CSIR Miningtek. K.Aki & P.G.Richards: Quantitative Seismology; Volume 1. Freeman and Company, New York, 1980. T.Dahm: Relativmethoden zur Bestimmung der Abstrahlcharakteristik von seismischen Quellen. Dissertation, Universität Karlsruhe, 1993. B.Efron & R.Tibshirani: Bootstrap methods for standard errors, confidence intervals and other measures of statistical accuracy. Statistical Science 1, pp.54-77, 1986. F.Finck: Application of the moment tensor inversion in material testing. Otto-Graf-Journal, Vol. 12, pp. 145-156, 2001. C.M.R.Fowler: The Solid Earth; An Introduction to Global Geophysics. Cambridge University Press, New York, 1990. C.U.Grosse: Quantitative zerstörungsfreie Prüfung von Baustoffen mittels Schallemissionsanalyse und Ultraschall. Dissertation, Universität Stuttgart, 1996. C.U.Grosse: WinPecker - Programm zur vollautomatischen dreidimensionalen Lokalisierung von Schallemissionsquellen. 12. Kolloquium Schallemission, DGZfP Berichtsband 72, Jena, pp. 191-204, 2000. C.U.Grosse, H.W.Reinhardt, F.Finck: Signal-based acoustic emission techniques in civil engineering. Journal of Materials in Civil Engineering, submitted 2002. S.Köppel & T.Vogel: Localization and identification of cracking mechanisms in reinforced concrete using acoustic emission analysis. Proc. 4. Int. Conf. on Bridge Management, Surrey, pp 88-95, 2000. M.L.Jost & R.B.Hermann: A students guide to and review of moment tensors. Seism. Res. Letters, Vol. 60, pp. 37-57, 1989. M. Motz: Vergleichende Schädigungsbewertung: Simulation und Schallemissionsanalyse, Ph.D. thesis, University of Stuttgart (2002) in preparation. F. Ohmenhäuser: Zur Rissorientierung in Materialmodellen der fiktiven Rissbildung, Ph.D. thesis, University of Stuttgart, 2000. M.Ohtsu, T.Okamoto, S.Yuyama: Moment tensor analysis of acoustic emission for cracking mechanisms in concrete. ACI Structural Journal 95, No. 2, pp. 87-95, 1998. M.Ohtsu, M.Shigeishi, H.Iwase & W.Koyanagi: Determination of crack location, type and orientation in concrete structures by acoustic emission. Magazine of Concrete Research, Vol. 43, No. 155, pp. 127-134, 1991. L.Oncescu & C.U.Grosse: HYPOAE  A program for the localization of hypocenters of acoustic emissions. Software für PC und Workstation, Rev. 2.0, 15 pp, 1996. S. Weihe: Modelle der fiktiven Rissbildung zur Berechnung der Initiierung und Ausbreitung von Rissen: Ein Ansatz zur Klassifizierung, Ph.D. thesis, University of Stuttgart, 1995.